After living in Namibia for a year, I constantly forget that friends and family back home still have many questions related to how I survive and function here. I thought it would finally be nice to answer some of these questions for all you curious people out there. Q: What do you eat in Namibia? A: Pretty much anything I can afford within my PC stipend. As a PCV, I am given a monthly stipend to buy essentials- food is obviously one of them. So, I am in control of many things I eat. My normal grocery list contains items such as bread, protein sources such as tuna, beans, or lentils (if the prices are right), vegetables, and chocolate. When produce is in-season, I typically purchase it from my neighbor, but all other times, I will buy from the store in my village or shopping town. Kapana and oshifima from the open market in Ongwediva. When it comes to traditional foods, I typically eat those foods with my host family, because, I really don’t know how to prepare them well at all. Since my host family is large, there is usually more than enough to share. Some nights, I am in the mood for oshifima (traditional porridge) and ombidi (wild spinach), and my host family lovingly shares with me. I do enjoy trying new foods and traditional staples and snacks. On weekends, I may find myself away from site to run errands or visit volunteers. If I am in a town, there are typically a few decent selections of restaurants to dine at. Not necessarily chain restaurants, but some tried and tested places. Local hotels or guest lodges serve burgers, pizzas, or green salad, but it also comes at a high cost on a volunteer budget. Volunteers also enjoy cooking together. Q: What is a koombi? It’s hell on wheels. Okay, it’s a large van. One or both of these statements are true. Q: Do you shave your legs? A: Sometimes, but not most of the time. I mean, as a PCV there is no requirement to do or to not do so. I personally have found it to be a chore these days than anything. I live on a homestead with an outdoor shower. So, shaving requires extra time for me to stand outside naked. I’ll pass. I could shave my legs in my room. But, then that requires me to make a trip or two collecting water to lather and rinse while trying not to end up covered in sand while doing so. No thanks. Q: What time zone are you in? Namibia is in the West African Time (WAT) zone. During daylight savings time, most of Namibia moves to West Africa Summer Time (WAST) for the summer months (beginning of September to beginning of April in Namibia) so we share the same time as Botswana and South Africa. So, throughout the course of the year, I am anywhere between 6-8 hours ahead of CST. Q: What is the main religion in Namibia? Many Namibians identify as Christian. The two largest Christian groups in Namibia are Lutheran and Roman Catholic. Other religions practiced in Namibia include Isalm, Judaism, Buddhism, and Baha’i Fatih. Q: Do people in Namibia speak English? English is the official language of Namibia, although there are multiple langauges spoken in the country. During apartheid rule, there were 3 official languages of Namibia: Afrikaans, German, and English. After Namibia’s independence in 1990, English became the official national language. Although English is the official language, it is regularly spoken by a small percentage of the population and rarely the first language learned by Namibians. Oshiwambo and dialects of Oshiwambo are spoken in nearly 50% of Namibian households, followed by Damara/Nama (11%), and then Afrikaans (10%). wOnderlust, they were so close. Stick to 2 bags (3 max). I should’ve listened to this advice. One should be a larger suitcase or duffel bag with wheels and the second should be a backpack. PST is not your final destination. Having luggage with wheels will make moving easier on you and all the people around you. You will be walking a lot and a backpack is more functional. I brought a small duffel bag, which was clearly the wrong choice. Also, keep in mind you want something durable enough for commuting 8,000 plus miles, but also durable enough because it will collect dust for the next 2 years. LOCK your checked luggage! LOCK your checked luggage! LOCK your checked luggage! LOCK your checked luggage! LOCK your checked luggage! LOCK your checked luggage! Things WILL go missing. Pocket knives, jewelry and especially electronics have been known to go missing in Johannesburg. Don’t even think about putting your valuables in your checked bags unless you want to arrive in Namibia without them. I brought lots (probably too many) snacks and spices. Because you know, after one month in Namibia I was suffering and devoured all of my Krave beef jerky. I would suggest bringing some ethnic spices or seasonings that you can’t live without, and also a few of your favorite snacks, but, don’t go overboard. It takes up valuable weight and space, and it is always nice to have items like that arrive in a care package. Surprisingly, you can find similar spices in major shopping towns/cities such as Windhoek. Volunteers have found sriracha, Heinz Ketchup, Oreos, and even Pop Tarts. There is food in Namibia. You won’t suffer…too much. 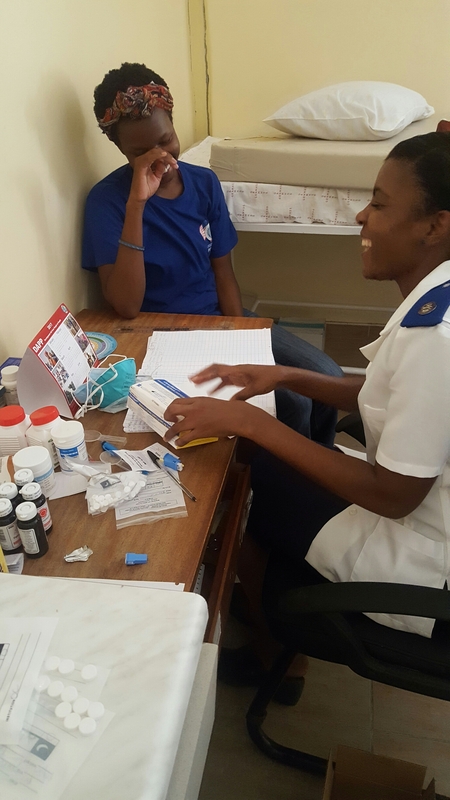 Health volunteers will most likely be placed in northern Namibia. I spend most of my days out in the community, so my dressing code (what it’s called here) isn’t too strict compared to maybe a CED volunteer who may be required to dress more business casual. I brought one nice pair of dress slacks and four or five skirts. These were acceptable during PST, but not functional or ideal for me at site. I would recommend keeping the business attire to a minimum. (You honestly could probably wear the same thing every day at PST, but don’t.) Health volunteers, don’t waste valuable space on a lot of business wear. Ladies, if you choose to bring dresses or skirts, make sure the hit your knee or below. I know the game we play. I’m 5′ 11″, sorry the ‘six’ key on my laptop is broken, but you will feel eyes looking at you if you decide to wear anything shorter. It’s just not appropriate in Namibia. Cute, form-fitting, and trendy is fine. Short is not. Group 45 will be arriving during some of the cooler months here in Namibia so take that into consideration when packing. You will not need a winter coat by any means but pack a light sweater or cardigan. Maybe, even bring a light jacket, mornings and nights will get pretty cold during those times. Don’t go out and purchase a lot of new items. If you’re unsure, go without, and you can purchase it here for a fraction of the cost. Bring clothes you are comfortable wearing at home. Those are the clothes you will be most comfortable wearing here. Don’t, I repeat don’t, go buy a whole new wardrobe. You will be here living and working, you won’t be a tourist or on vacation (most of the time) so don’t spend too much time at REI. If you work out at home or you are considering working out during service, bring workout clothes and even some equipment, if you must. If you don’t want your nice athletic wear getting ruined, DON’T BRING IT! Because you will snag your $40 reflective running tights on the fence post on your homestead and it will be the saddest day ever. Volunteers have brought kettlebells, yoga mats, and resistances bands from home. All of these things are also available in-country as well if you rather not tote these items across the globe. Bring a hat, umbrella, and at least one sweater. Most of the time it’s sunny and sometimes it’s cold. As a health volunteer, my Chacos sandals are my go-to. I choose Chacos over Tevas because I think the soles can outlast the northern Namibian terrain. I’ve seen acacia thorns do damage to some of the sturdiest soles. I wear these almost every day because of the amount of sand I trek through to get to and from work. Bring at least one nice pair of shoes for church, weddings, retirement parties, or even a PC event. Slippers are a must around my room because of the insects. Oh, and shower shoes. I just make cold brew coffee in my Nalgene now. You can get all household essentials in-country with your settling-in allowance. I think a volunteer even purchased an iron and an ironing board with theirs. If you bring a water bottle, bring one that is 32 oz or smaller. My Nalgene carries 1500mL, which is a pain to travel with (there I go complaining about water), but it gets heavy. I would even suggest a thermal type of bottle. Wait to buy sheets here. They have several bedding stores to purchase them. You won’t know what your living situation will be for the next 2 years right away, so just wait to purchase bedding. Toiletries, such as toothpaste, deodorant, soap, shampoo, etc., you can find here. Unless you are brand loyal, only bring enough for training. Ladies, if you don’t have a DivaCup. Get one (or two). Feminine products can sometimes go weeks without restocking, especially in a village. Sunscreen is provided by Peace Corps Namibia unless you need a higher SPF. I think PCN provides SPF 30. Bring products from home. I think there is one store in Windhoek that sells natural hair products, although, I haven’t been able to locate that store yet. Many women here do not wear their natural hair, so the product selection is slim or non-existent. I have found some alright brands, but they do some damage to your PC stipend. So, stock up on your shea butter, jojoba oil, oil treatments, and do yourself a favor and bring a small spray bottle also. I received mine as a gift a few years ago and was a little hesitant on bringing it, but I’m so glad that I did. I didn’t even have much time to read for enjoyment back home, but you will have plenty of downtime during your few months in-country and at site. Volunteers love to share books. If you have an electronic reader, BRING IT! You will hear mixed reviews on bringing a sleeping bag. I’m from Texas, so when I got to my permanent site in June the nights were cold for me. I slept in my sleeping bag every night. If you choose to bring one make sure it is compact. Like super compact. A sleeping bag is also useful when overnighting at other volunteer sites or if you plan to go camping while you’re in Africa. Ear plugs! Bring ear plugs. I can promise you the first few weeks or even months you may have a hard time sleeping from the dogs, chickens, and other noises. Also, save the little courtesy pouch from the international flight. It has a sleep mask which I use on the weekends to sleep in until 745a. See you soon and happy packing! malaria immunity. what’s your superpower? Meme insisted that I got tested at the clinic. I carry sickle cell trait. Let’s clear a few things up before I go any further. Sickle Cell Disease (SCD) also known as Sickle Cell Anemia is an inherited form of anemia in which mutated (sickle-shaped) red blood cells do not carry enough oxygen throughout the body. Because of this, the red blood cells “stick to the walls” and cannot pass through capillaries. As a result, this causes chronic pain (sickle cell crisis) typically at the location of the “sticking,” which is often crippling for those who suffer from SCD. SCD is common in those of African descent, but similarly Mediterranean, Middle Eastern, Caribbean, and Asian Indian ancestry can also have SCD. A carrier of Sickle Cell Trait is a person who only inherited one mutated gene of SCD. Remember dominant and recessive genes in biology class? In most cases, carriers of sickle cell trait are asymptomatic and commonly do not have issues related to SCD, although there are always exceptions. Interesting research shows that carriers of the sickle cell trait are IMMUNE to malaria, because SCD stems from mutated red blood cells which carried malaria. Now, malaria is a real nasty disease. Malaria is caused when an infected mosquito transmits a parasite, most commonly P. falciparum, to its host. Symptoms of malaria include fever, headache, chills, and vomiting. 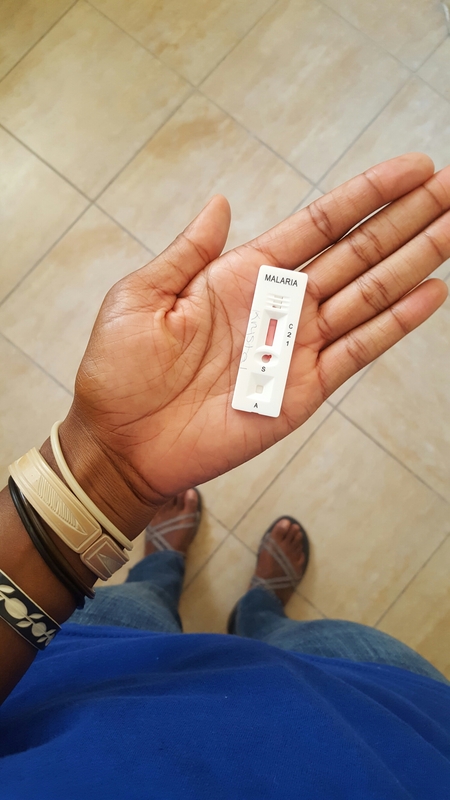 If left untreated, malaria can lead to more severe symptoms including death. Does anyone like needles? Nurse Anna laughing at pain. Don’t get me wrong. Being genetically resistant to malaria is really cool. But, it does not make me immune to mosquito bites or mosquitoes buzzing in my ears a night. So, I make sure to sleep under my properly installed ITN (insecticide-treated net) and wear insect repellent. Doctors still recommend carriers who live in malaria zones to take daily prophylaxis, especially during the rainy season – which is now in Namibia. Hey, the more you know. Lowering of the flags in Eenhana, Ohangwena, Namibia. Culture, defined simply, is a total way of life for a particular group of people. Similarities of thinking, speaking and behaving are ways we define ourselves and those like us. Humans are complex beings. It’s amazing that through all of these complexities, there is one thing we all have in common. Humans, by design, notice differences. Americans, defined simply, generously teach people how to do things the right way. Bless our hearts. Subconsciously and sometimes consciously, we’ve place superiority over other cultures due to this mindset. At times, we look at these differences and instead of accepting them for what they are, we label these differences as right or wrong. Heading home from my morning jog. There are numerous cultural differences between back home and my new home in Namibia. Everything from manners, beliefs, knowledge, morals and values, laws, religion, government, food, family dynamics, clothing, the list goes on. But, each day I have to decide to let those differences make me love my host country more while providing myself with the opportunity to learn or leave a sour taste in my mouth while deciding whether these differences are right or wrong. Katie and I enjoying kapana, oshifima and oshikundu our taxi driver, Thom, treated us to. For myself, I make a daily effort to not use the words “America” or “American,” while speaking to HCNs. Unless I am responding to specific questions asked or comments made, I don’t use these words. I want to avoid comparing Namibia to America at all cost. Similarly, I don’t want only focus on the differences between cultures, that will certainly cloud my experience of living abroad. Being completely submerged in a culture different from my own is not an opportunity many of us get our lifetime. So, if it means eating with my hands, running barefoot through my village, or even sitting amongst locals and not understanding a word being spoken, I want to fully embrace the culture right in front of me. This post is part of Blogging Abroad’s 2017 New Years Blog Challenge, week three: Cultural Differences. things no one tells you about being a pcv. I have compiled a list of Things No One Tells You About Being a PCV. Enjoy! You’ll be tempted to use a dirty plate, fork or spoon, once or twice. And once or twice, you’ll actually do it. If you are one of the lucky PCVs, you will have no kitchen sink, which means handwashing everything. It’s fine. It’s soothing. But, some days I just want a heaping scooping of peanut butter, just one scoop. Sand. You will eat sand, you will be covered in sand. All the time. Aww, you’re cute, you must have read all the PC blogs from Micronesia with volunteers in their hammocks overlooking the ocean? (I’m guilty, too.) Well, in Sub-Saharan Africa there is sand. Lots and lots of sand, and most times no water. No, no water. You will wake up next to an insect (dead or alive) more times than you like. You get used to it. One morning, I woke up and was sharing a pillow with a praying mantis. I was awake, he was still praying. Then, there’s the morning I woke up cuddling a with a moth. He didn’t make it. Just expect to find bugs. The more you prepare for this, the less traumatic your service will be. You’ll have a pet spider (maybe even two or three) in your hut. Luckily, in Namibia, most of these are non-venomous, so I let them live to eat other pests such as mosquitoes. Refer to your Spiders, Snakes and Scorpions handbooks from PST and you’ll be fine. You will also lose track of how many times you pee outside, in a bag, or in a container, because, you have no choice. I think my bladder has shrunken. I will walk 1 km home from the clinic, and the second I see the pit latrine, which is about 100 m from the gate of my homestead, I sweat bullets while scurrying across the yard before it turns into “Bridesmaids in Namibia.” It’s like an awful Pavlov’s dog experiment. TMI. But, do what the locals do, sometimes you just can’t hold it. Your ADLs will be a community attraction. I mean, host family still watches me wash my laundry (and sometimes they take pictures of me while doing it). The spotlight is ALWAYS on. As long as no one is hurting you or over-violating your privacy, roll with it, and then blog about it in good fun. You will find a new hobby or revisit old ones. Meditation, photography, blogging, baking, reading, exercising. You will have plenty of free time between the 24/7 in which you’re Peace Corpsin’. Trying my hand at sourdough bread. Bowl would’ve been a good option prior to this. You will learn new meanings for words you’ve known all your life, ready? Yes = Maybe or No. Maybe = Maybe but most likely No. No = Yes, No, or Maybe. Although being a PCV 24/7 is many times exhausting, you appreciate the world and your community on an entirely different level. *Links in the post are current and returned PCVs in Namibia who post regularly. Add them to your list of blog reads. For my two years prior to coming to Namibia, I worked at Starbucks. Happy #PSL season, y’all! If you have ever been to Starbucks, you know that after you order your friendly barista writes (or attempts to write) your name on your cup. From a simple task such as this, you realize how important someone’s name is. For goodness sake, there are websites devoted to barista fails. Why is this such a big deal? Because it is. Your name is part of your identity. Without a name, how will you know that the quad grande half-caf 2.5 pumps vanilla latte with 4 Splendas, no foam, stirred, at 127 degrees sitting on the edge of the counter is yours? Okay, I need to stop bringing up my painful past. Names are a part of every culture. Names give us a sense of belonging, uniqueness, and identity. It’s strange to think that names cannot be taken from us and they don’t die. Names are important. In some cultures, due to high infant mortality, infants are not even given a name until after their first birthday. While in other cultures, particularly in Namibia, people are given two names: a birth name and a Christian name. Quite often when introducing myself (Edina lange oKrystal or simply Ame Krystal) and asking for one’s name in return (Ove lye? ), I typically get more than just that. For example, it’s usually something along the lines of, “My name is Tobias, it means God is good”. Knowing a person’s name builds a connection. People, no matter where they dwell, feel connected when you know their name. It makes you feel wanted, needed, it builds trust and relationships. It’s a tradition that PCV are given a name by their host communities. I was a little reluctant at first, because immabehonest. I like my name. I feared that my Namibian name wouldn’t suit me or I wouldn’t like it or I wouldn’t remember it or even respond to it. You know? Reasonable fears. So, ladies and gents, the moment you have been waiting for… now introducing, Miss Krystal Ndapandula. And guess what? I don’t hate it. And I actually respond to it. Ndapandula (pronounced Ndaw-pan-doola) means thank you. This name was given to me by my host brother, Freddy. Ndapandula is a common name in Namibia. When I introduce myself as Krystal Ndapandula, it makes me feel more “Wambo”. But, also ‘Krystal’ is hard for locals to pronounce, so throwing in ‘Ndapandula’ is the icing on the cake. I think my community appreciates my efforts of integrating. Each day as I become more and more cognizant of my responsibility to others, I want to live up to the name I was given. By humbling myself to serve a higher purpose beyond me and by putting my community’s needs above my wants for my community, I strive daily to be a volunteer Ondobe is actually thankful for.